I hope I get to sleep late. And if I do get breakfast in bed, I hope it's blueberry muffins. They're my favorite. I'm sure my husband will find me the perfect card. Maybe the perfect gift. I know I will get a lovingly made construction paper card with beautiful artwork from my daughter. And I'm sure I will have a wonderful day lounging around my pool with no housework or chores to do, and my husband will come home from his visit with his own mom to cook me a scrumptious steak for dinner. I'm sure it will be a happy day to remember. But I also remember the other ones. I remember the ones filled with sorrow and tears. And heartache. There were too many ever to forget. I remember the many Mother's Day mornings I wanted to just stay in bed with the covers over my head. I remember going to church on many bright and sunny Mother's Day mornings. And I remember sitting there in the pew, surrounded by all the lovely mothers in their lovely dresses, holding their lovely children and their carnations. And I remember sitting there as the priest would ask them all to stand up and be recognized. And all the mothers. All the grandmothers. Occasionally all the stepmothers -- and I did get to stand and be acknowledged for that. But never all the wanna-be mothers. That was me, the woman with the empty arms and the broken womb and the broken heart. Nobody ever remembers us on Mother's Day. Those of us who are trying. Those who have lost. Those of who are waiting and holding their breath. Some for the call, some for the day, some for the ink to dry on their paperwork. I used to wish there was a ribbon campaign for us. Yellow for soldiers, pink for breast cancer. Maybe lavender for those of us who are waiting? It's not like we can tell everyone we meet, "I'm trying." Although, sometimes we wish we could. 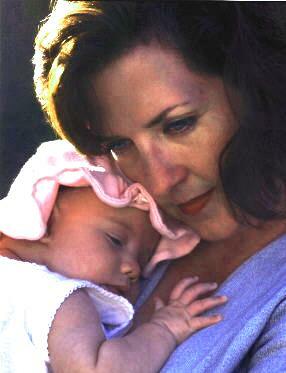 And I never will forget that first sunny Mother's Day morning I did walk into church with my baby in my arms. The first time I was handed a carnation -- from my own stepson, no less -- and didn't feel like I was stealing it. And the first time I stood up as a member of the club. But I also remember the ones who are waiting.